Welcome to the Monthly Studio Report, where we collect updates from our various studios around the world to show you what they’ve been working on this past month. In the rush up to the holidays, the entire company was focused on accomplishing two major tasks: pushing Star Citizen 3.0 to the Live Servers and polishing up work on the Vertical Slice, which featured an hour of gameplay from Squadron 42. Afterwards, everybody broke for some much needed rest before coming back to hit the New Year running. With that said, let’s get to it. Alpha 3.0 was a monumental engineering milestone for Star Citizen, particularly for the LA vehicle team. During December, the first tier of Item 2.0 for ships was finalized with several bug fixes and important features closed out for 3.0. The team tackled a major hurdle with the integration of UI with this very complicated system. Finally, some of the underlying systems that play a huge role in Squadron 42 and the Persistent Universe (Scanning and Quantum Travel) saw some iteration and prototyping that they were really proud to bring to fruition. As the 3.0 release came together, the core system team focused polishing and stabilizing some key parts of Star Citizen. Cargo and shopping saw significant bug fixes, bringing these features in alignment with long term goals. Infrastructural game code such as the room system, interaction system, and even damage saw significant bug fixes right up to the release. LA Tech Design spent the majority of December getting the new Item 2.0 ships working as smoothly as possible for Star Citizen Alpha 3.0. They knocked out a multitude of bugs, including but not limited to enter/exit alignment issues on the Scythe, an issue where damage was not passing to all parts of a ship, seat access issues with the Caterpillar, atmosphere bugs in the Herald, and IK issues in the Mustang seats. The team also spent time balancing the shield stats to account for better power retention and heat generation, hooked up cursors to all player interactions in the ships, and finished setting up bed conversions from Object Container to ItemPort. Beyond Alpha 3.0, they continued to work on ships like the Anvil Terrapin, the revised Consolidated Outland Mustang, and Tumbril Cyclone to get them set up and flyable (or drivable, as the case may be). They also completed design briefs for the [REDACTED] ship that they are really looking forward to. Lastly, the team supported the UI Team in completing the Scanning Visor, MFD, and hooked up all assets to be released in the future. The Ship Art Team wrapped up 2017 with a bang. The new RSI Aurora was completed and officially released. 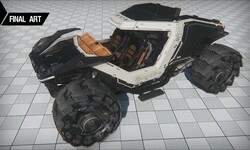 Major progress was made on several other vehicles such as the Anvil Hurricane, the reworked Consolidated Outland Mustang, and the Tumbril Cyclone. The team had their fair share of bug fixing and support tasks for various features released with Alpha 3.0 in addition to upcoming releases. The Character Team put the finishing touches on the Squadron 42 cast for the Vertical Slice. One key development was the work done with the graphics team to implement a new hair shader to make the characters shine. Finally, the team added wear and tear to some of our character loadouts, giving them an authentic feel in-game. In December, the Narrative Team worked closely with Design to chase down any lingering bugs and issues that arose to ensure that mission content, item descriptions, and even posters were ready for Alpha 3.0. They also helped provide additional environmental storytelling and prop write-ups to help sell the world of Squadron 42 in the Vertical Slice. In addition, they delivered weekly lore updates, wrote three pieces for Jump Point, continued the development of the Xi’an language, and supported the marketing department on numerous tasks including the Tumbril Nova brochure. The Global Technical Content Team delivered some great accomplishments in December to wrap up 2017 on a high note. The Tech Animation team was busy with tools support, character rigging, and various MoCap tasks throughout the month. For tools and related work, they improved Mannequin Python Tools, the CIG Tools Installer, a Jump/Spike Detection Tool, and the Skeleton Table as well as added several new health checks to the pipelines. The team also supported the S42 Vertical slice by rigging several characters and fix a ton of skinning bugs as well. The MoCap team tracked, solved, and processed a large group of characters in support of Squadron 42. A MoCap shoot was also held to capture some additional footage needed for key characters. 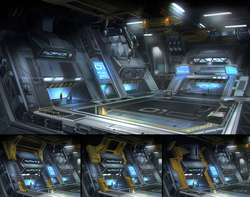 On the Tech Art side, the team sub-divided between Environments, Ships and Weapons. For Environments, a lot of support and R&D was put into our glass shader and a vertex curvature script. Additionally, they planned for Procedural Layouts work coming in 2018. A lot of bugs were investigated as well… for lights/shadows, hair rendering and texture streaming. For Ships, the team supported the release of the several new vehicles in the Alpha 3.0 release. This included work on damage and VisAreas, as well as bug fixing and investigating a lot of log spam issues. The team also worked on landing gear compression for the ships in the Around the Verse holiday special. Finally, on the Weapons front, the team was in R&D mode for Animated Attachments/Magazines. They made progress on the P8AR magazine, Gemini F55, and a skin transfer script/tool. They also fixed several weapon bugs. Lastly, the Global Technical Content team supported other areas, such as the reorganization of the tool branches. Getting 3.0 ready to go live was the big focus this month for the ATX Design Team. Using feedback from those testing the PTU builds, they were able to tackle a variety of bugs relating to shopping and cargo trading across the stations and moons surrounding Crusader. The economy and item pricing continued to be balanced based on collected analytics. Of course, there is still a lot more dialing in to be done once the systems function together on the live servers. Further work on Mission Givers Ruto and Miles also was an important task for the team. Representing a complex mix of numerous systems like animation and subsumption, it has been encouraging to see the progress made on getting these first two characters into the game. We have already learned a lot so far that will help streamline and improve the process in the future. With the release of 3.0.0 to Live, the community finally got to see the updated Constellation Aquila, Drake Cutlass and Aopoa Nox. The ship team spent the month providing support to push the Persistent Universe to the Live servers. 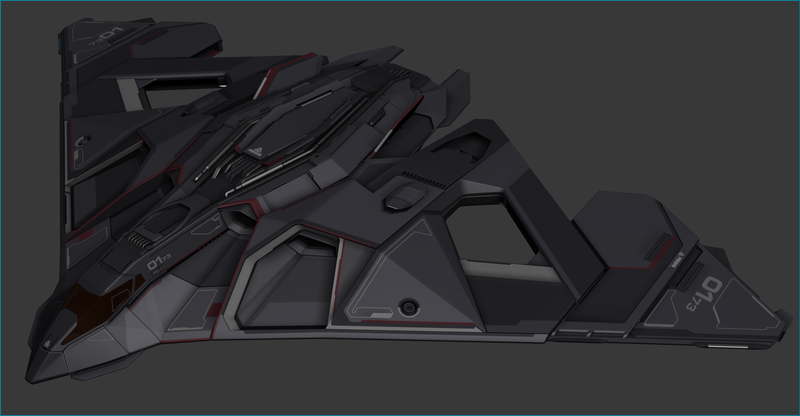 The Constellation Phoenix was whitebox complete and progressed onto greybox. Meanwhile, the Anvil F8 Lightning entered the whitebox phase at the beginning of the month and progressed nicely in between bugfixing tasks. To start the month, the DevOps team delivered multiple PTU publishes each week. They monitored performance and feedback from the Evocati and PTU players and pushed out builds that contained fixes and feature deployments as fast as possible. They also worked with IT to ensure everything was ready for the Live release. This included dealing with a number of system failures just prior to 3.0 going Live. After the intensive 3.0 publishing process, the team carefully tracked the bandwidth being used and adjusted the servers accordingly. They also worked with design to apply a number of hot fixes to address unexpected issues that negatively impact performance and gameplay. They accomplished this without affecting players by carefully watching servers and restarting them with the better code when the server population reached zero. In addition to everything surrounding the Live release, the team continued to support devs with diagnostics, performance captures, and more. The Animation Team this month spent time looking at the Player experience in Alpha 3.0 to make sure that all the animations associated with the various interactions that people would encounter while running missions and exploring around Crusader were looking good as possible. This included some bug fixes, some adjustments on various transition elements, as well as just general polish. The team also began work on the Tumbril Cyclone animations that were recorded in a motion capture shoot last month. On the ship side of things, there was additional technical set up that was needed to be looked at on several ships as the team investigated a few linger issues that had been noted by players testing the PTU. As Star Citizen Alpha transitioned between the PTU and Live, needless to say ATX QA had a busy month, tirelessly testing the bugfixes and change submissions to the 3.0.0 build. One of the biggest challenges, especially with a release that incorporates as many new updates and features as this one, is making sure that fixes to the game don’t destabilize a build in other places. To help minimize this risk, the devs adopted the QA test request system more vigorously, and every single feature-related check-in towards the end had to be tested thoroughly. Although this increased the team’s workload in order to maintain the daily pushes to PTU, this process helped ensure that the army of testers would have a stable enough build to keep providing key feedback. With the holiday season right around the corner, there was a lot to be “tonkful” for this month. Right on the heels of Star Citizen’s Anniversary, the Player Relations team assisted backers with the newly announced Aegis Hammerhead and Anvil Hawk. Plus, the Holiday Special brought with it the Tumbril Nova tank and three exclusive Holiday Game Packages perfect for sharing Star Citizen with friends and loved ones. The team also continued to coordinate with the massive ongoing testing effort as alpha 3.0 PTU continued to roll out to more and more backers, and most excitingly, the build went Live! Thanks again to all the Players for their ongoing contributions to the Issue Council. Your help is vital to the project. Over the last month, the graphics team focused on both 3.0 and the Squadron 42 vertical slice. Most of that time involved bug fixes. Highlights included major fixes to texture streaming bugs (they’ve since found another bug in Lumberyard and the fix will vastly reduce VRAM usage on the next release), a fix for facial animation glitching, and various fixes for hair and temporal anti-aliasing. They also continued to develop the Render-To-Texture system, including adding expose control to video comms calls and using the system for the new ship targeting displays. The Squadron 42 vertical slice also benefited from some of their new features, such as a new cloth shading model, improved light-beams, the debut of volumetric gas-cloud tech, and a new particle-based shield effect that uses signed-distance-fields to allow the particles to flow smoothly along the hull of the ship. Their r-focus for the new year will shift to improving performance and various planned shader improvements to enable more dynamic materials. The team was really excited to reveal the Hammerhead in November and since then they’ve been hard at work finishing the exterior sections not seen in the video. They did a detail pass across the hull and engines, and gave the underside more attention. The landing gears were also added, so the exterior is now ready to start on the damage set up. For the interior, they blocked out the floor plan using existing Aegis kits from the Idris and Javelin. They also worked out what bespoke and new pieces are needed to finish the interior and have a couple of guys at work on these now. The Avenger has been undergoing a complete re-make to address issues with the original and make it conform to the current ship metrics and requirements. The updated Avenger revealed in the Around the Verse holiday special was a combined effort between the ship team and the newly formed Squadron 42 team. The cargo and bounty hunter variants are art complete, and work on the EMP variant is scheduled for January. Work to finalize the remaining exterior parts, such as landing gear, damage and LODs, will start soon. The 600i is entering the final art phase. On the exterior, the thrusters and landing gear are near completion, and work is due to start on the turret. The interior is going through a polish pass, while work on the bridge, corridors and exploration module are due to be wrapped up soon. Since the last update, the team listened to backer feedback and removed the struts from the bridge windows. The Gladius was a big part of the Squadron 42 Vertical Slice, so they spent time tweaking it for the demo. This included implementing the new glass and screen shader, cockpit lighting and headlight tweaks, screen sizes/positioning and adding the new starmap. Cockpits are the most complex parts of the ships, bringing together input from across the company, and they went through many iterations before satisfying the requirements of all departments. Work continued on the Eclipse, as the cockpit and exterior were grey boxed. The mesh is currently going through a detail pass before starting on textures and shaders. 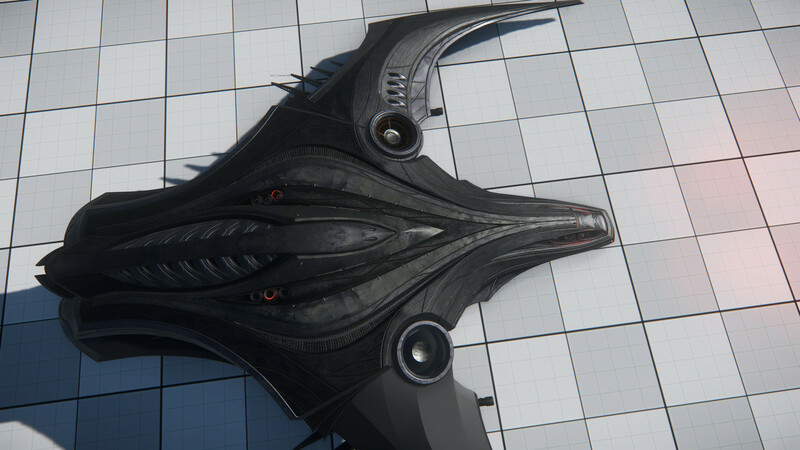 The Vanduul Blade exterior is almost complete, and has been brought into line with other Vanduul ships. The team’s current focus is on the interior and working out the enter and exit mechanism for pilots. The UK VFX team spent December bug-fixing and optimizing for 3.0, following on from the sanity pass discussed last month. R&D work continued on signed-distance-field shield effects, including power-on, power-off and impact effects for the Gladius, Cutlass and Buccaneer. They also honed in on the finer effect details seen in the Squadron 42 Vertical Slice demo. There are too many to name individually, but highlights include the Coil itself, the lightning storm inside the giant asteroids and the Slaver base cryo-pods. The team also made solid progress on VFX for the Scanning feature. Amongst other things, it will emit a virtual particle grid (only seen via the UI) that allows players to better visualize 3D space when they’re in, well, space. The UI team spent December splitting their time between wrapping up features for 3.0 and working on bugfixes for the Squadron 42 Vertical Slice. On the PU side, the team had daily standups for each feature with Directors to get feedback straight away. These daily syncs not only helped progress for the Starmap, PMA, VMA and MFD/Visor holodisplays, but ensured that communication was kept close between the various departments involved in pulling these features together ahead of 3.0 going Live. In the run up to the Holiday Special, the UI focused on various bug fixes, including ensuring that the Visor UI would turn on at the correct time, removing quantum linking text from the Gladius HUD, and providing performance fixes alongside others to polish the experience. In addition, fluff screens for Chemline were designed and implemented ahead of the stream. In December, the environment team delivered final optimizations and bug fixes deemed as ‘must fix’ for the release of 3.0. As those tasks were completed, the team began to work on the next environments. A big focus of 2018 will be on getting spaces that are shared across locations functional, so the team worked on whiteboxing the kits for both hangars and habitation modules. The idea is to create kits for all these ‘common’ elements in a specific art style so they can be used across different locations. The whitebox stage allows design, art, and code to lock down the features of an element before committing to final art. Elsewhere, the DE team has been looking at improvements to the planet texturing systems. The main goal is to improve the diversity and breakup of terrain types across a planet’s surface. The new tech increases the number of supported distribution channels by 5x, meaning there’s some improved visuals across terrains in the not too distant future. The audio team had all hands on deck in the lead up to the Squadron 42 Vertical Slice. They ensured the demo was fully supported with all the Dialog, Music and SFX content required. This work included additional sound design for cinematics, location ambience polish pass, ship SFX balancing, dialog attenuation/mix pass, and new music content/logic implementation via Subsumption. The audio team simultaneously supported the Alpha 3.0 release with content creation, implementation and polish of dialog, SFX, and music assets. These included implementing new music logic and content for PU armistice zones (Olisar, Levski and Grim HEX), improving definition and intelligibility of weapon sounds, and adjusting thruster sounds for the Dragonfly and Nox in light of ongoing flight model tweaks. Going forward, the audio team looks to iterate on the current Foley system and actor status system (breathing component). They also plan to begin work on a fully fleshed out sound simulation system. The Concept and Tech teams introduced a new core structure and narrative behind how Lorville on Hurston function and come together. They developed an exciting and visually interesting city archetype for integrating procedural and landing zone elements. The team did an extensive amount of concept work to solve most of the major design issues. The base archetype for a utilitarian habitation was established for the first procedural and fully interactive room. Concept is busy investigating and solving both material and theming diversity for generating these units across the Stanton system. This month, the team wrapped up the super large Tumbril Nova tank plus three other new ships of varying sizes and roles. They also provided support where needed and helped with marketing and new website revamp. For ship weapons, the team completed the Trident Laserbeam S4-S6 and the Hurston Electron Beam Alterations S1-S3. The Derby Facial team was super busy right up until the 21st Dec with Facial animation tasks ranging from polishing the Prisoner Arrival scene to adding more in-game dialogue for random NPC characters. The team also held their first Studio Christmas Party. It was a fairly small key event, but a good chance for staff and partners to enjoy some good food and a couple of drinks. The UK programming team did a lot of bug fixing and polish work to get Alpha 3.0 out of the door as well as the Squadron 42 Vertical Slice in preparation. On the cinematics side, they implemented the dynamic lighting mentioned last month. This allows the devs to fade up a specific lighting rig for a cutscene to highlight the quality of the characters. They also experimented with a new dynamic depth of field (DoF) mechanic for non-combat scenarios to give the game a more cinematic feel. Rather than having an infinite DoF, which is usually the case, the game focuses on what the player is currently looking at and applies a subtle blur for everything that is nearer/further away. The networking team worked on serialized variable culling, which will eventually become entity bind culling. This stops the server from distributing the state of variables on an entity after a certain distance. Considering the massive size of the PU and the content required to fill it, sending updates to everybody became a bottleneck. This helps the network bandwidth and performance side, as the server/client doesn’t have to deal with nearly as much data. The downside is that when the code is not expecting this behaviour, these edge cases introduced new bugs that needed to be found and worked through. Otherwise, they tackled other performance issues and optimizations, polished as many features as as possible before the end of the year, and a enjoyed a nice break over the holidays! The DE Engine team spent a majority of the past month focused on improving performance and addressing issues for the current Live release. In the process, they worked with most other disciplines to help profile items and make recommendations and/or fix issues when needed. Some cases are straightforward and addressed promptly, but for others the fix may be deemed it to risky to address immediately. Those items are still worked on, but will take a bit longer to verify and be included in future patches/releases. In addition to performance improvements, they worked with the Environment Art team to further enhance the visuals of the planet terrain. They made improvements to a new memory tracking tool for both server and clients. Implemented scripts to automatically analyze gathered statistics to quickly find leaks and dubious allocations. Fixed several issues related to how data is collected in our crash database Sentry. They started implementation of horizon based SSDO, and the initial results look really good. They reworked the cloth shader to use a more physically based shading model for cloth, as well as fixed shading discontinuities within it. They also reworked the motion blur implementation in game, and continued work on the Subsumption visualizer. The Level Design department finished locations found in the 3.0 release ahead of schedule, so they focused on both bug fixing and polish during the latter part of December. After 3.0 was in PTU for a while, the decision was made to increase the server size. That meant they had to add more spawning areas to enable people to spawn in smoothly without conflict with one another. Finally, the DE Level Design team is looking to expand. As more features come online, they’ll need additional designers to keep on top of the increased content and the R&D for upcoming system solutions and releases. The DE Tech Art team split their time between both 3.0.0 and Squadron 42 tasks. They’re currently extending the FPS weapons pipeline with a new tool called CIGSiknXfe which will enable weapon artists to transfer skin weights to different meshes from one source skinned object. They started work on real-time cloth and flesh sim R&D and development of a live-link between Maya and the game engine, so animators can tweak animations, in particular facial animations, while enjoying the advanced shading quality of the in-engine real-time renders vs. Maya’s own low quality viewport renders. 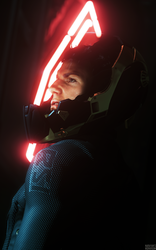 This tech will be particularly useful for integrating and tweaking the p-cap (facial) animations in Squadron 42’s cinematic cutscenes. This artistically controlled lighting will have a huge impact on the look and feel of an animation/performance, meaning that iterating real time and in-game will make things much more efficient for the team. Last month, the VFX team focused on the Squadron 42 Vertical Slice. They contributed to the Coil volumetric cloud, adding exterior effects to the slaver base on Gainey, and specific effects for the cinematic sequences. They dressed the exterior of the Slaver Base in the low technological style with suitable effects for the dusty planet surface. The cinematic effects were bespoke for the cutaways in the vertical slice. The work on the Coil gas cloud tech went through a good amount of R&D. The team focused on developing methods to create an interior volume while keeping in-line with the base concepts and art direction. It went through numerous iterations, and they paid close attention to how the interior created interesting compositions and visuals while flying. The FPS weapons art team completed the first art pass on the Gemini F55 LMG and the Torral Aggregate Kahix Missile Launcher. Meanwhile, the ship weapons art team finished the first pass art for the A&R Laser Cannons (Size 1-6) and the Gallenson Tactical Ballistic Gatlings (Size 1-3). The team has also been working on scripts and tools to help further speed up their art pipeline. One such script is a Ship Weapon Tool made to assist in the creation of modular weapons. This new tool creates a larger number of weapons in a short amount of time by allowing artists to preview different component setups in real-time and automates the export process directly to the game engine. All animation exports and engine related meta-files are handled by the script, leaving the artist to focus on making the art. The Build Engineers added QA-TR (QA-TestRequest ) options to trybuild, which has already proven beneficial for the team. They also developed a feature to offload QA-TR trybuilds to dedicated agents in an effort to reduce compile times. So far, trybuild has been a simple code validation tool through which coders must check if their changelist compiles correctly against the most recent code updates. This ensures the next build will function correctly if they submit their changelist. This newest feature allows coders to have their changelist compiled against a specific CL. Within the tryBuild UI, the user can select an archive option and will receive an email with a link to a zip archive containing their binaries. At this point, a programmer can send a request to QA (namely QA-TR) asking to thoroughly test their binaries, making sure that their fix and/or new feature works as expected. If QA approves the changes, then the programmer can submit their changelist. This provides an added layer of security, helping to reassure that the current active build is functioning as expected. Since the archive option also involves changing two waf compile options, compilation times inevitably got longer. To work around this issue, IT set up dedicated trybuild machines whose sole role is to accept trybuild requests only when the archive options is ticked. This brought the trybuild system back to normal compilation times. The DE QA team spent December dealing with various in-house test requests for 3.0 and focused Squadron 42 testing. For 3.0, Hangar and shield test requests were completed for our Level Design and AI team, while additional testing for character movements was done for Animation. They also obtained in-game footage of the current state of various systems to be reviewed at a director level. Mission Giver testing was done for Ruto and Eckhart, as well as specific footage recorded for each of these NPCs with criteria provided by the Design team. DE QA eventually shifted focus to testing Squadron 42, specifically testing Combat AI, Flight AI wildlines, and AI turrets. They worked closely with the development teams designated for each of these sections as part of individual sprints to ensure that they had the needed QA support. For Combat AI, regular stand-up and review meetings were held leading up to the Squadron 42 Around the Verse holiday special. This involved reviewing the state of Combat AI daily and creating JIRA reports for any new issues called out during the review, as well as regular testing of the Combat AI. To test AI wildlines, they regularly played the vertical slice up to the dogfight that happens after quantum traveling to Gainey moon, then they had to ensure that all intended wildlines would trigger based on certain events performed by the Player. December was a very intense and productive month for the AI team. Regarding Subsumption, they introduced several new functionalities: the new Subsumption Event Dispatcher, the Mastergraph, and the Dynamic Trackview implementation. The Subsumption Event Dispatcher is a way to fully support the Subsumption events without relying on any other external system. It’s composed by a central system that allows user code to create and send an event. The events are created in a pool to allow the AI system to efficiently handle and reuse the allocated memory, and each signal lifetime is automatically managed by specific structures called Handlers that also allow fast access to the signal itself. User code can specify a direct event to an entity, or send an event to all the entities in a range from a specific location. Send events in a range is now zone safe and all the code efficiently uses the zone system for special queries and entity filtering. The Mastergraph is a way for building a relationship between multiple Subsumption activities. The team wants a general way for handling assignments (requests from designers), combat and regular activities. The Mastergraph allow them to specify transitions between our scheduled activities and other logic that should be executed when specific events are received. They also provided support for dynamic trackview scenes. A dynamic trackview scene is a cinematic scene where the participants can be replaced at runtime with actual AI NPCs. This allows the cinematic designers to work on their scene in a controlled environment. It also allows level designers to populate their level with NPCs that might have different activities, specific clothing, customizations, etc., based on how the Player affects the game. All the changes in the character might influence the real NPC characters and be part of the cinematic scenes. Also, dynamic trackview scenes can be potentially interrupted, so the AI system needs to know how to take over when and if that happens. Ships AI also got some attention last month. The Squadron 42 Vertical Slice showed the first version of the updated spaceship behavior. The current Movement System is in control for both on-foot and flying movement requests, and Subsumption is in charge of controlling the pilots/seat operators behaviors. The new spaceships are fully controlled by the NPC seating on the operator seats, each operator has specific behaviors to use the items they control. The first version of turrets has been implemented using Subsumption, and initial accuracy parameters introduced for the NPCs using seats items. The missions system progressed for the Star Citizen Alpha 3.0 release, introducing both environmental missions and interdiction. All the logic required for Office Admin NPCs was implemented to allow designers to create delivery and pickup missions. Additional work was done as well, which they’ll provide more details in the near future. The Cinematic team spent the month hard at work prepping the relevant sequences and tech needed for the Squadron 42 Around the Verse holiday special . Here’s a small portion of what they’ve been recently working on. They scaled PCap performances for the character Vat Tagaca, played by Craig Fairbrass, to emphasize his real-life, intimidating body stature. They changed the base lighting of the Idris aft hangar deck, featured when the Argo arrives, to be darker and more moody than the standard light setup. There was much back and forth with AI and Cinematic Tools Engineers to get the AI functional and the tools to properly place them. Work was done to the Trackview Navspline tech that allows them to precisely puppeteer AI ships, like going from the interior zones to outside Shubin space seamlessly. They worked with engineering on several features that enrich the game cinematically. They prototyped and then enabled an always-on autofocus FSTOP based Depth Of Field (mostly for non-combat situations) that adds a filmic realism to walking around and exploring interiors. The team successfully created a couple of gold standard scenes, which take into account all departments necessary and represent the flow and interaction that will be applied to future applicable scenes. Tech that uses lightgroups as cinematic light layers for scenes was also completed. With default or custom individual timing of lights coming online, any scene can be tagged and a corresponding lightlayer triggered to fade in. This can be a light rig per scene or per location, as both are viable. The cine lighting rig will be used to push certain cinematics further than what the environmental base lighting provides. The cinematics team generally doesn’t go into too much detail, so they don’t spoil the story, but they’ll go into more detail on the Vertical Slice in a future update. Last month, the DE Environment Art team spent time preparing for 2018 and the challenges ahead. It is always good to look back at the progress made during the year and realign the goals for the new year. A lot of preparation and R&D went into updating the planet tech and tools. As the game moves from moons to full planets with more visually diverse ecosystems, the team wanted to have more control and variety of colors and materials. Work is being done on updating the planet tech as well as the shaders used on the scattered assets. This allows them to have the visual palette they want in the upcoming locations. It also provides a nice visual update and boost in quality for our existing moons. The System Design team spent December finalizing work on both 3.0 and the Squadron 42 Vertical Slice. A lot of the work went into the first major mission givers, Eckhart & Ruto, and ensuring there are no edge cases where they can get stuck or players can abuse them. Both presented different challenges, as each has their own conversation flow, way of being found and triggered. They also completed the first implementation of the Admin Officer for all our major locations. Once again, many edge cases had to be considered and a lot of work went into making sure the players can’t block him for too long or give him items that he can’t properly handle. There are still some issues, but the team is sorting out the solutions. Another big focus was FPS combat AI. It’s not finished but showing a lot of promise. The combat AI are beginning to act in a more believable manner, as they continue to add behaviors, adjust the timing of combat, and strive to get AI fights to feel challenging and fun to play. Things they also completed include: override pump upgrades to doors, hatches received locks that could be cut through, the beds in the Idris got upgraded with shutters, and more complex usables were added to make the game feel more alive. December was a release month as the Turbulent team was instrumental in getting 3.0 in your hands! Finally released, the new RSI Launcher replaces the CIG Patcher that was previously used to distribute the game assets to your desktop for Star Citizen 2.6 and lower. This release marks a major milestone for the team as the entire system that powers the launcher will allow us a direct integration path with the game where we will be now be able to open communication between your game sessions and the Spectrum client through integration points. This also opens the door for integrated anti-cheat sandboxing systems. Getting the launcher in your hands as part of 3.0 has been our team’s main focus for while as multiple rounds of testing on multiple platforms have taken place to ensure the new delta patcher, UI, installer and application shell perform well in all supported machine types and versions. 3.0 release also marks the deployment of the launcher backend which provides a new and secure way to distribute game update notifications and asset authorization to backers. A separate team was split from the main group to work on a new and updated Roadmap display engine for the producers at CIG to use to update the community on the schedule and plans for the game. This new engine will allow the producers to create releases, place them in time and have feature cards on each to describe a feature of the game planned for a specific period. We hope this new format will make the schedule updates more fun to read and will also help the teams produce more updates, as the backend systems provide more tools to update the schedule per feature card. Our design team added life to the Tumbril Nova concept in December, fleshing out the first ground vehicle tank in the Star Citizen universe, inspired by 1980’s action figures. This week is your last chance to pick up a Tumbril Nova in the concept phase! Throughout December, the web team has been hard at work on the next iteration of the Star Citizen site. You can view a full report of our work on Welcome to SC in the January episode of ATV! We are hoping to launch a first pass of this new iteration in the first month of the year. While December is traditionally an action-packed month for Star Citizen, the team took it to the next level in 2017. On December 22nd, the Squadron 42 Vertical Slice was revealed during the Around the Verse holiday special and shared more than one hour of raw gameplay, including a special version with Director’s commentary from Chris Roberts himself. If you’re interested in more information about Squadron 42, you can enlist now to receive regular updates and exclusives on the updated Squadron 42 page here. The holiday special also introduced the legendary battle tank — the Tumbril Nova. This battlefield dominator is available through January 15, and you can find all of the details here. If the Holiday Special was not enough, the team published Star Citizen Alpha 3.0 to Live servers just before the holidays. This required a herculean effort by teams around the globe and we’re not finished just yet! Releasing Alpha 3.0 has opened the gates for what promises to be an exciting new year of updates to the Star Citizen universe. If you’re curious to see what’s next, you’ll be able to check in with our updated roadmap for 2018 that will come online with the revised RSI website. We said it last month, but we’ll say it again — thank you to each and every one of the dedicated testers who helped make the release of Alpha 3.0 possible. We truly appreciate you and your efforts! Thanks to the release of Alpha 3.0, we have also seen a massive influx in community-created content submitted to the website. We highly encourage you to browse the Community Hub and check out all of the new videos, screenshots, guides, music, 3D prints, and more. Keep ‘em coming! Lastly, we’ve taken the time to go through and organize your feedback on a variety of topics. We’re in the process of planning and executing some fun changes that you’ll see rolled out during the new year. And with that, we’ll see you in the ‘Verse!